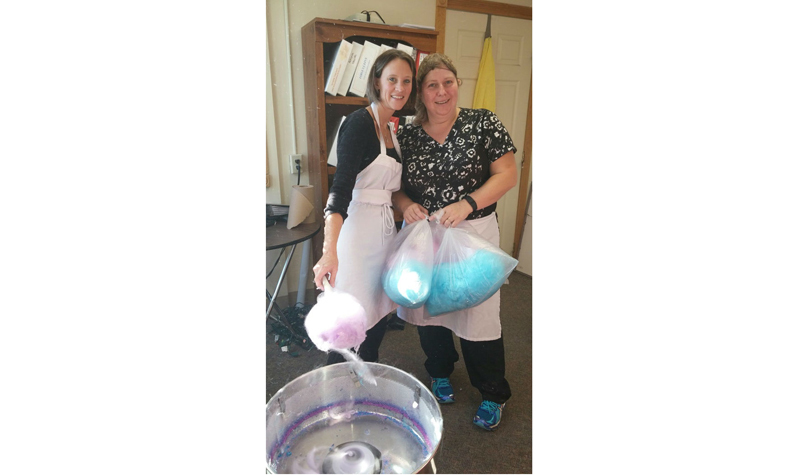 Burnbrae Gardens administrator/life enrichment co-ordinator April Faux (left) and dietary aide Janet McInroy (right) are seen here during the Campbellford long-term care home’s cotton-candy fundraiser on Nov. 9, 2016. If Burnbrae Gardens residents or staff members need something, dietary aide Janet McInroy is always there to help, even if that means using up her personal time, say two of her colleagues, registered practical nurse Kim Jones and personal support worker Juanita Baird. Additionally, Janet has spearheaded many fundraising events at the Campbellford long-term care home over the years, such as bake sales to help support extra activities for residents. During the holiday season, Janet makes special treats for residents to enjoy Christmas morning, something Kim and Juanita say residents look forward to every year. Her co-workers also point out that as a dietary aide Janet always makes sure residents requiring texture-modified diets are served pureed treats when there is special food offered to ensure full participation of all residents. These are some of the reasons Janet was nominated for Burnbrae Gardens’ 2018 Everyday Hero Award. Janet was presented with the award during a recent ceremony at the home. “Janet also takes the time out of her dietary role to interact with residents, and she always has a smile on her face,” say Kim and Juanita in nominating Janet for the Everyday Hero Award.